Asus has introduced Zenfone 4 Seflie and Zenfone 4 Selfie smartphones with a Dual front-facing a camera .check out Price, features comparison with Vivo V5 Plus which also comes with a Dual front camera. Both Phones comes with Metal body and Fingerprint Scanner on the front. Both have Dual Front camera. On Display, both phones come with a 5.5-inch 1080 x 1920 pixels Full HD Display powered by 2.0GHz Octa Core Snapdragon 625 processor with Adreno 506 GPU. It has a 4GB of RAM and 64GB of internal storage. 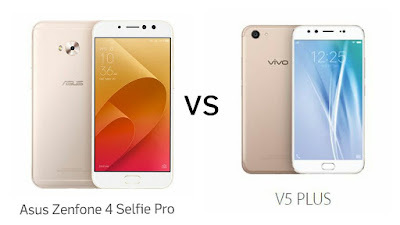 Asus Zenfone 4 Slefie Pro comes in Rouge Red, Sunlight Gold and Deepsea Black priced at US$379 Vivo V5 Plus comes in a Gold color priced at Rs 22990.